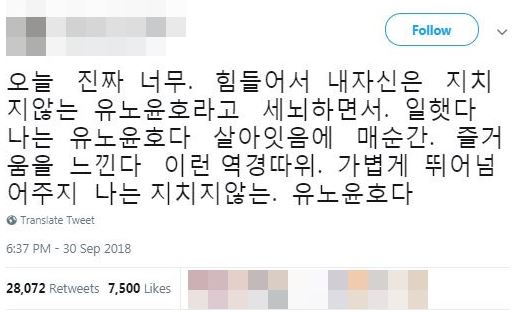 Recently, the word, "I'm U-know Yunho" is used as a buzzword in the social network service (SNS) such as Twitter and online community. The word, so-called, 'U-know Yunho mind-control' seems kind of 'spell' to self-control. 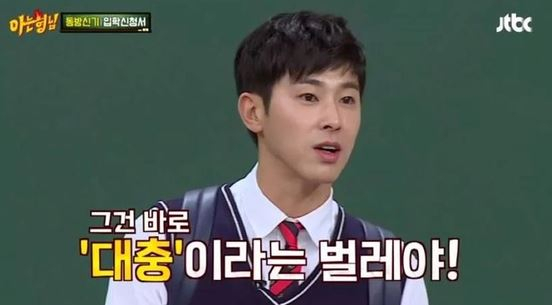 The group TVXQ's member U-know Yunho(32·Jung Yunho) is a veteran idol who debuted 15 years ago but has been steadily accumulated faithful images by showing the moment he practicing diligently via broadcasting program he appeared. The beginning of 'U-know Yunho's mind-control' is like this. 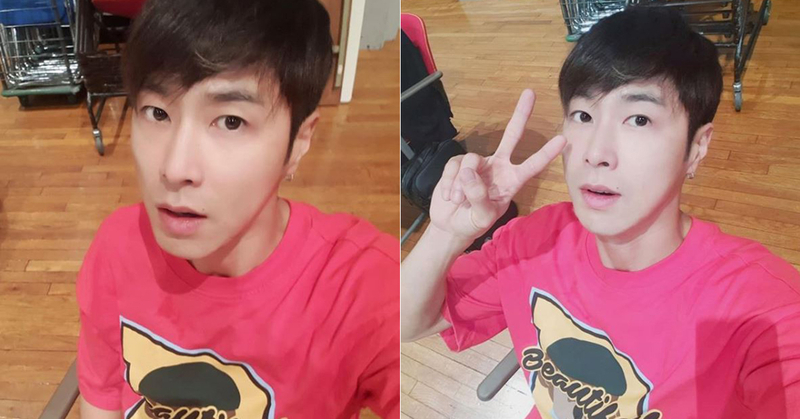 The words U-know Yunho's mentioned in the past suddenly reappeared on Twitter. 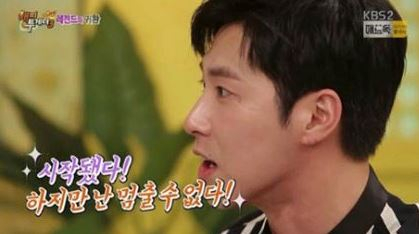 It is the words that Yunho said when he appeared on JTBC Knowing Bros in October last year. 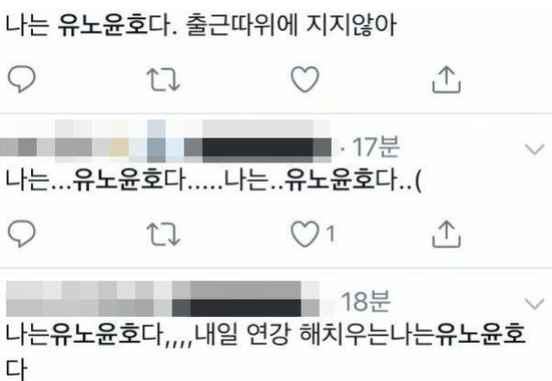 -What is the worst haechung(harmful insect in Korean) for the human body? -"The most harmful insect for the human is daechung(slapdash in Korean). 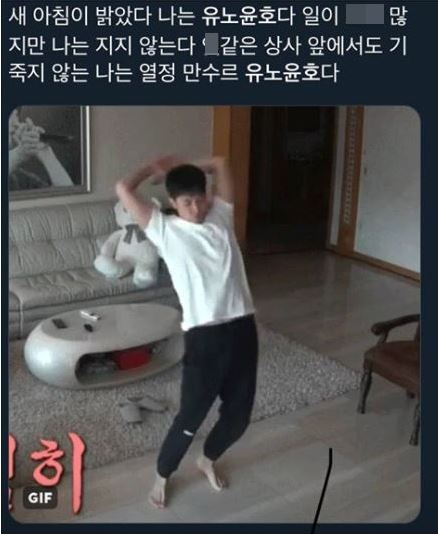 One netizen who saw this broadcast mentioned on his Twitter, "Today I was too tired so I brainwashed myself with 'U-know Yunho mind-control'" and repeated "I am U-know Yunho. I enjoy every single moment of being alive. I can easily overcome such an adversity". This post was re-Twitted(shared) more than 28,000 times based on October 3 record. On that day, 'U-know Yunho' also topped Twitter search word ranking. -If you got passion, there's nothing you can't do. This post soon pulled out many sympathy and parody. Here's another hot-issued post. "I am passionate=I am happy to do this work=I never get tired=I can beat this adversity=I am a U-know Yunho"
"When you don't want to do something, but if you say 'I am a U-know Yunho. I am the guy full of passion', you can suddenly do anything by burning enthusiasm. From now on, let's call this 'Jung Yunho effect". 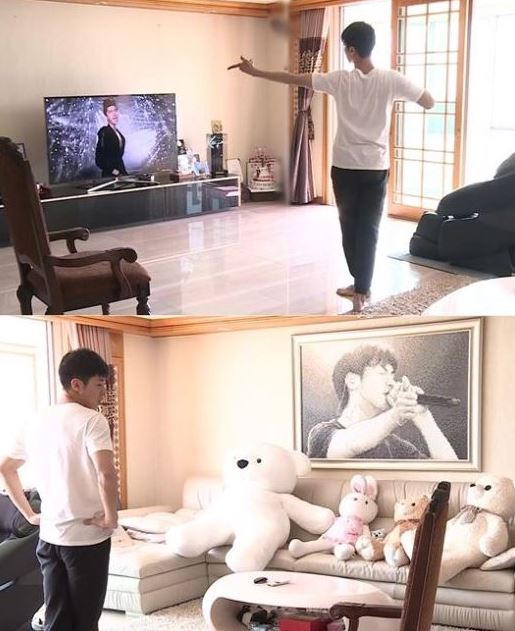 Last March, when U-know Yunho appeared on MBC 'I Live Alone', he shared the moment he practicing choreography right after he woke up. Also at that time, there was a phrase, "New morning has broken. I am U-know Yunho. I got lots of works but I am not tired. I am the incarnation of passion, U-know Yunho who never discouraged by boss". 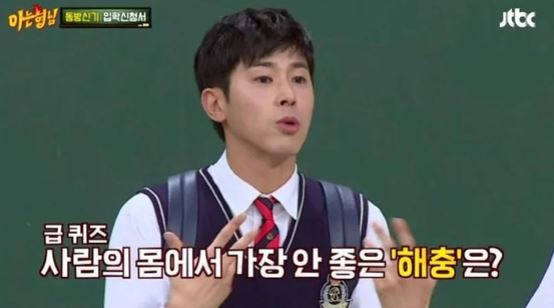 Many netizens who worry about impending situations such as 'Monday Blues', they repeated 'I am a U-know Yunho'. Which is like, "I am a U-know Yunho. 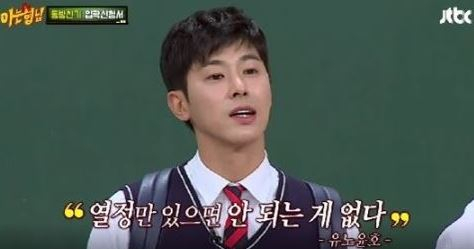 I have to take more than 200 online lectures for a month", "I am a U-know Yunho. Now it is the first period of Monday". 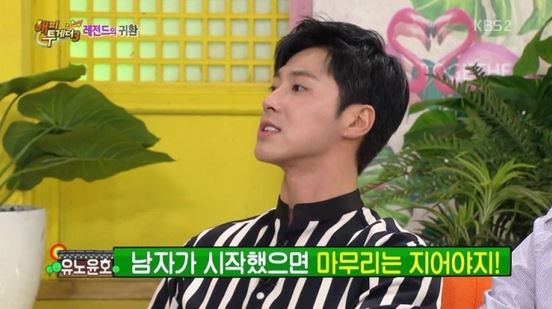 One netizen was surprised and said, "Seems like people seriously suffer to endure Monday" and "There are more than 15,000 U-know Yunho phrases on Twitter". 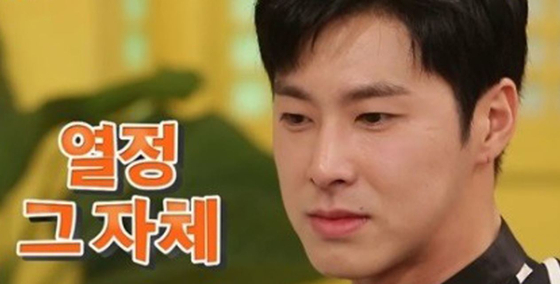 About this, another netizen analyzed, "Seems like people want to live like U-know Yunho from October". There are netizens who hypnosis themselves but on the other hand, there are people who say "Let's live roughly. 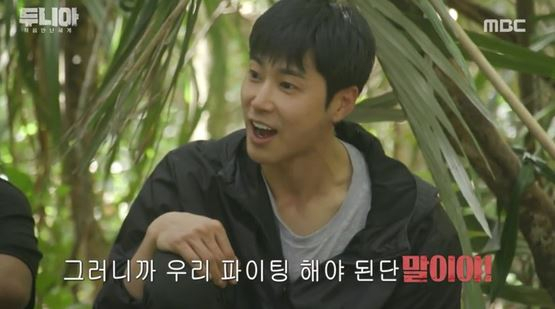 U-know Yunho is already living life to the full for me".